The border opening was particularly significant, however, for those in Eritrea. Over the last two decades, hundreds of thousands of Eritreans - around 12% of the entire population - have fled Africa's "Hermit Kingdom". They have braved an official "shoot to kill" policy at the closed borders to escape into either Sudan or Ethiopia and embarked on perilous trips - risking predatory militias, exploitation, sexual violence and unforgiving tundra - with the aim of reaching Israel, the Gulf or Europe. The new ability to travel freely to Ethiopia - without a passport, permit or promise to return - suddenly offered an opportunity to leave Eritrea with far lower risks. Many have seized it. According to the UN Refugee Agency and local authorities in Ethiopia's Tigray state, arrivals from Eritrea have soared. Between 12 September and 2 October alone, over 10,000 people entered reception camps in Ethiopia. Along Sudan's eastern borderlands, smugglers tend to derive from the nomadic Rashaida, Bedouin and Hidarib communities. They ferry "clients" in pickup trucks for a stretch of the journey before offloading them to the next group. These segmented expeditions allow poorer migrants to adopt a "pay as you go" approach, travelling in stages and working ad hoc to pay off their debts and raise the next tranche of funding. This avoids the need for expensive lump sums. For years, Sudanese smugglers have marketed these services upstream to Eritreans through front "companies" and local contacts. Exploiting shared kinship bonds and tribal affiliations, they placate suspicious migrants by framing voyages as "low risk" and insisting refugees will receive support from compatriots in the diaspora. Often recruiters entice customers by distorting their expectations with promises of informal welfare nets and assistance in finding employment along their journeys. 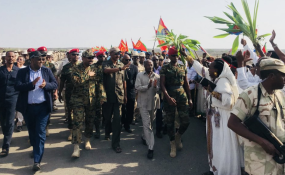 To begin with, the usual factors compelling Eritreans to flee - including repression, indefinite conscription and economic hardship - are all still in place. There is little incentive for the regime to scale back the "garrison state" as national service and systems of indentured labour ensure a pliable society and secure its survival. At the same time, many Eritreans may be wary of taking the current changes at face value. Having lived under President Isaias Afwerki's authoritarian and sometimes capricious rule for decades, many may wonder how long the border with Ethiopia will actually remain open, while rumours of security crackdowns abound. The influx of migrants crossing into Ethiopia has also strained Tigray state's reception camps, processing infrastructure and health services. Over-saturation and an under-resourced host population has led to a deterioration of living standards for refugees, revealing the bleak realities facing migrants who have already crossed the border. A final factor behind Sudan's continued appeal for Eritrean refugees is that its smuggling networks remain in operation and are likely to endure in the face of any broader regional shifts. Sudan's smuggling nexus is not composed of kingpins or cartels but flexible networks of small competitive cells subscribing to the "supermarket principle" of high volume with low costs. This decentralised quality makes local service chains extremely versatile, enabling them to adapt to the closure of old routes and rescale to manage fluctuations in demand. Bosses with political connections may (temporarily) control particular bottlenecks, but in relatively unregulated areas such as eastern Sudan, barriers to market entry are low. Here, the smuggling industry comprises a series of loose working relationships that dissolve and re-form in response to new opportunities. The durability of Sudan's networks also stems from their depth. Participation in, and profit from, smuggling is fairly ubiquitous in Sudanese communities living along migrant routes, with young men reportedly joining trafficking gangs to make quick cash before public festivities like Ramadan. More broadly, these exploitative practices have also become relatively normalised in these communities, especially in the context of Sudan's own economic crisis, helped by the fact that they generate revenue streams and a cheap labour supply to satiate domestic shortfalls. Due to this significant level of public buy-in, there is little institutional capacity or inclination in Sudan to crack down on human smuggling. As a result, the trade has been able to survive and thrive as it responds to new challenges. This resilience of Sudan's smugglers combined with Eritreans' mistrust of their government and Ethiopia's difficulties in handling large numbers of arrivals may account for why refugees are not automatically opting to cross the open border to Ethiopia rather than journey through Sudan. Despite seemingly momentous regional shifts, these factors have contributed to situation in which irregular migrant flows from Eritrea to Sudan appear to have held relatively steady.